Agustin Ramirez, a tobacco picker for the Mitchell twins, looks to deliver his handful of tobacco on Friday, Sept. 12, 2014. 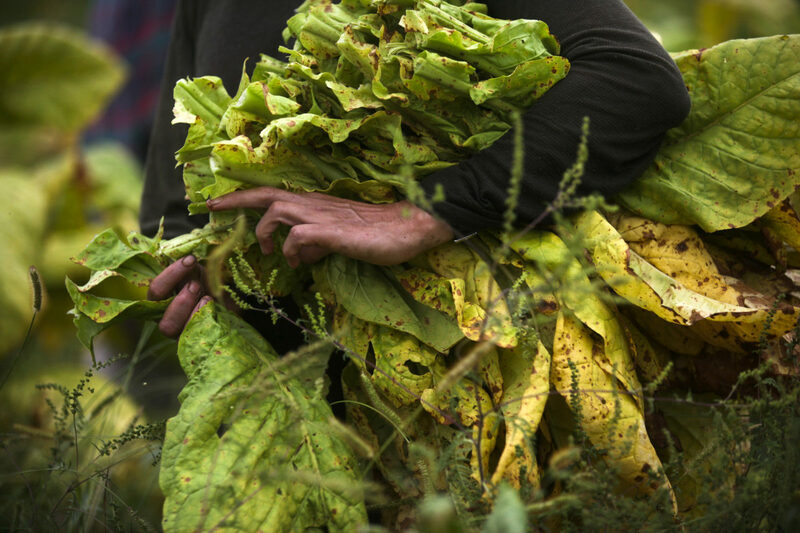 Steve Mitchell and his twin brother David are tobacco growers in the Snow Creek area of Franklin County, Virginia and raise 70 acres of flue-cured tobacco each year. 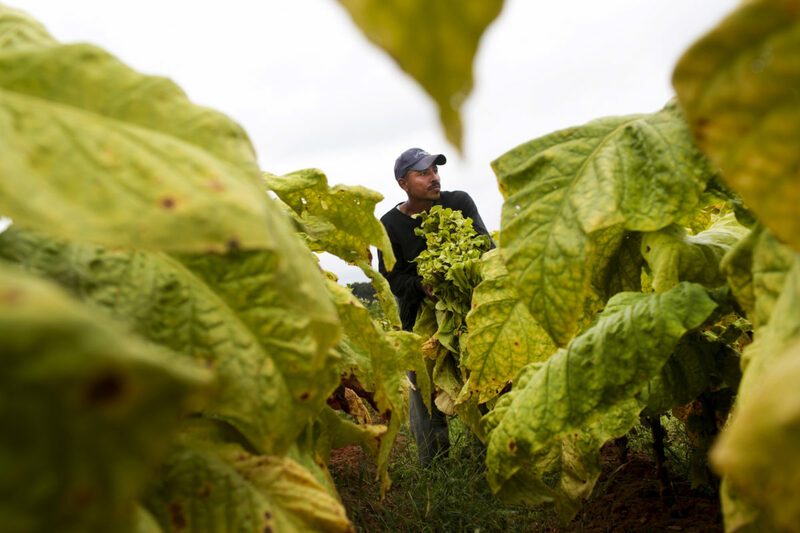 Steve Mitchell, 60, watches his hired workers pick tobacco on Friday, Sept. 12, 2014. 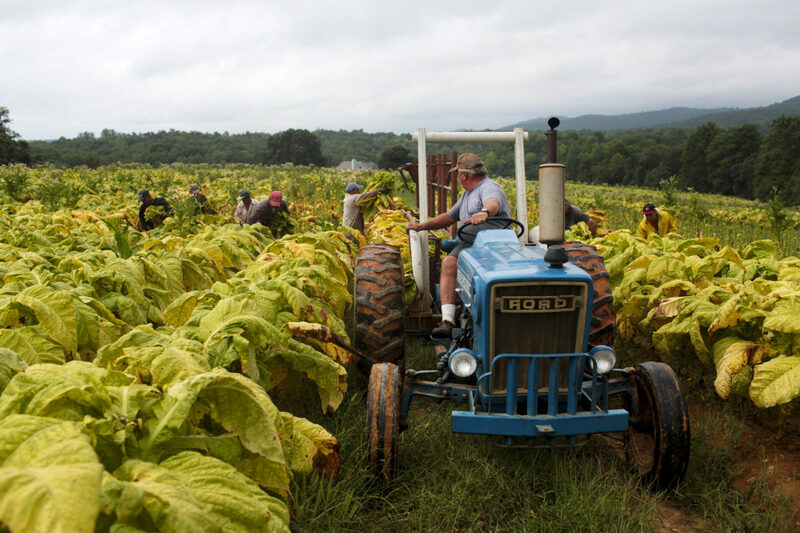 Steve and his twin brother David are tobacco growers in the Snow Creek area of Franklin County, Virginia and raise 70 acres of flue-cured tobacco each year. 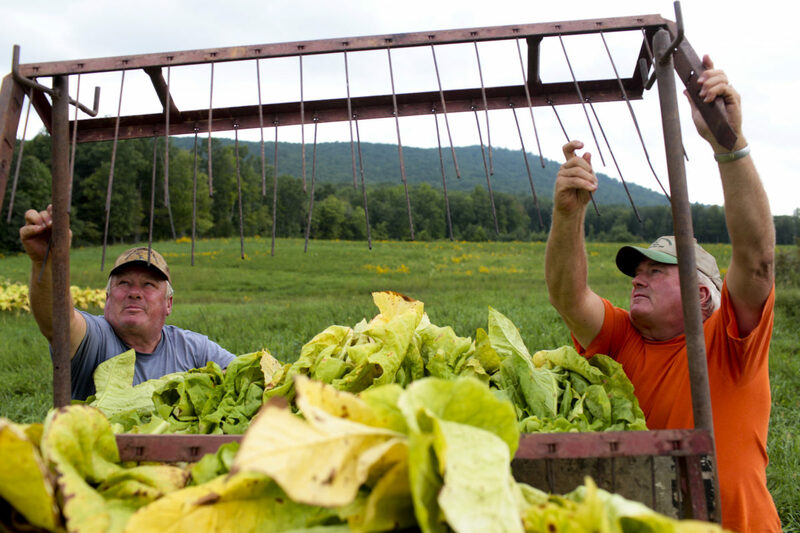 David Mitchell, a 60-year-old Franklin County tobacco grower, and his twin brother Steve, stayed the course, holding their production essentially steady and adhering to the contracts they had signed as if they were quotas. "Hell, I dont want to grow any more," Mitchell said. "Im not greedy. We just basically stay the same. If everybody did that, it would be a lot better."
A tobacco picker for the Mitchell twins holds a handful of tobacco on Friday, Sept. 12, 2014. The clothing of tobacco pickers lay to hang dry inside of a hot house on Friday, Sept. 12, 2014. Many are seasonal workers who come from Mexico that are paid through a federal program. 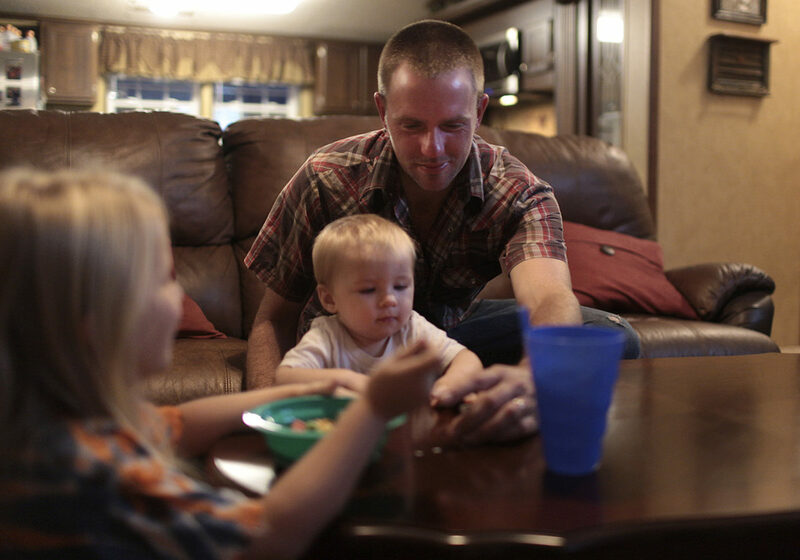 Taylor Ray Amos, 28, spends some time with his children, Walker, ten months old, and Taylee, five years old, in the morning at home before he heads out to work. 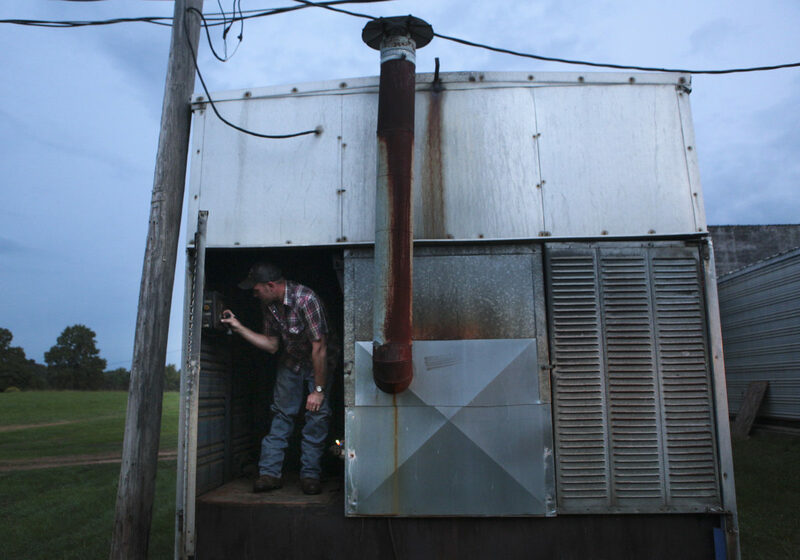 Taylor Ray Amos, 28, checks the curing barns and adjusts the temperatures at the start of the day. 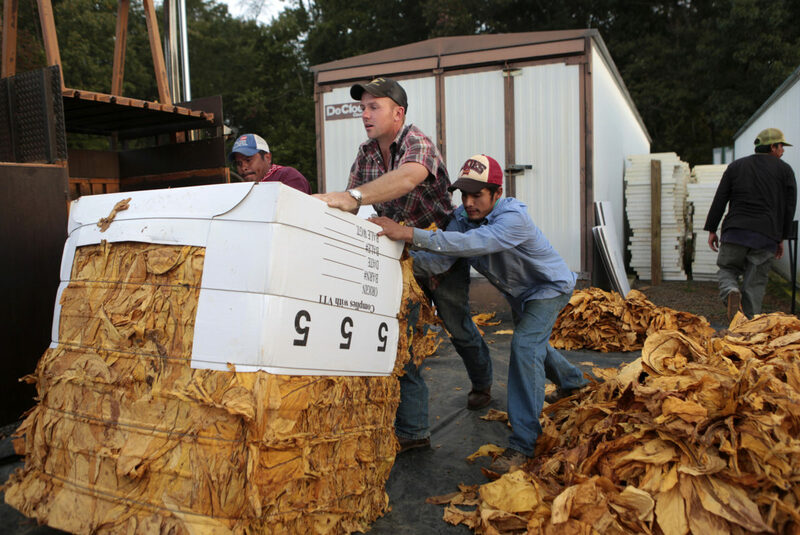 Taylor Ray Amos, 28, center, flips a bale of tobacco with temporary workers Jose Luis Galarza Zuniga, left, and Jose Manuel Hernandez Herrera, right, on Wednesday, Oct. 8, 2014 to load onto a lift that will place it onto a trailer. Amos had about thirteen workers from Mexico helping him that morning, packing anywhere from 630 to 800 pounds of flue-cured tobacco in one bale. They made about 12 bales of tobacco in the morning before heading back into the field to pick more tobacco. He has about less than half of his tobacco fields to harvest. 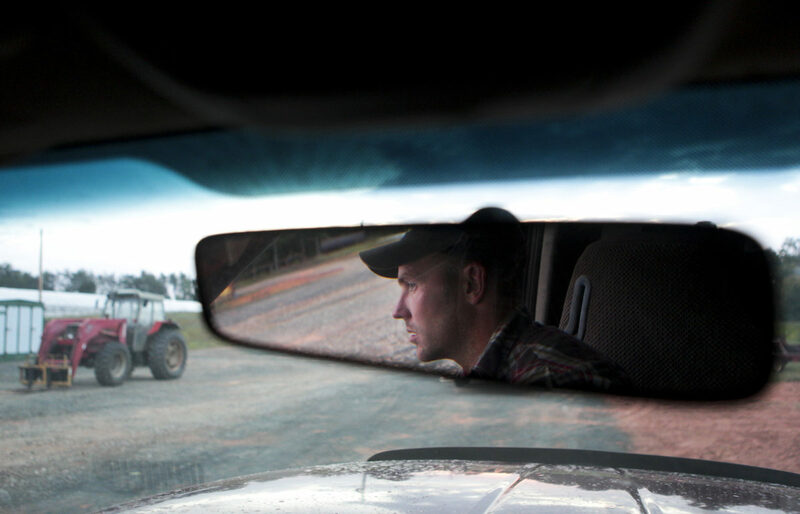 Taylor Ray Amos, 28, pulls into where his flue-cured tobacco hangs in several barns. "I love what I do everyday. If you really love what you do, you never work a day in your life," he said. Amos continues a long tradition of raising tobacco in his family. 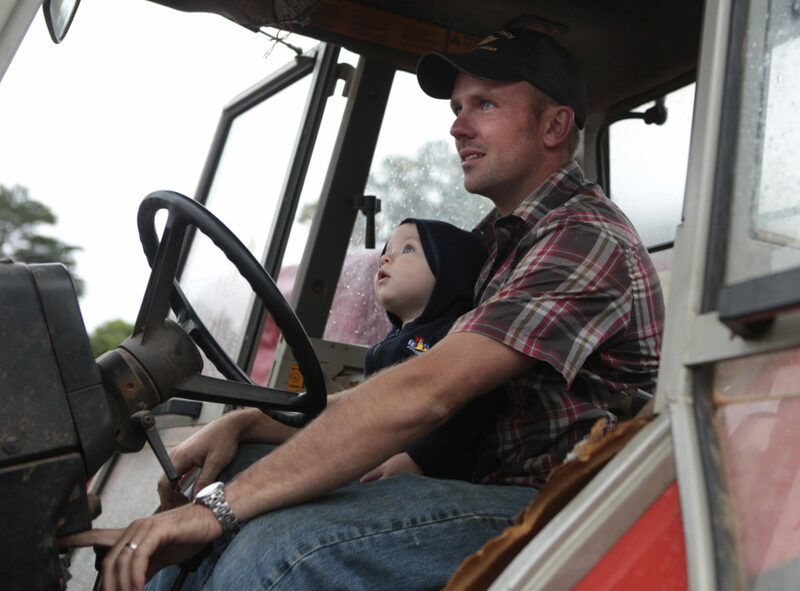 Taylor Ray Amos, 28, holds his son, Walker, ten months old, inside of a tractor while Amos works on baling flue-cured tobacco in the Snow Creek area of Franklin County. "Since I was 5 or 6 this was what I wanted to do. I didn't want to do anything else," Amos said. He says he'll give his son the freedom to do what he wants with his future, although Amos would fully support Walker if he ever decided to raise tobacco. 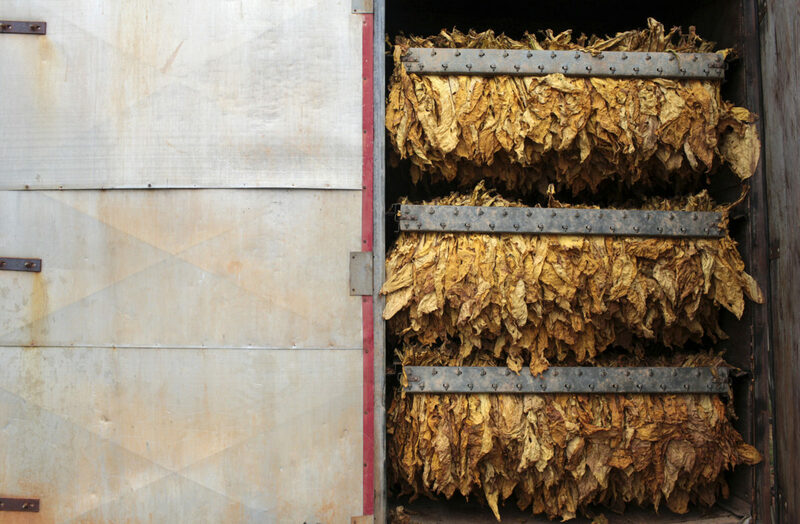 Flue-cured tobacco is seen inside of a barn. The tobacco cures anywhere from eight to ten days and reaches temperatures of up to 160 degrees. 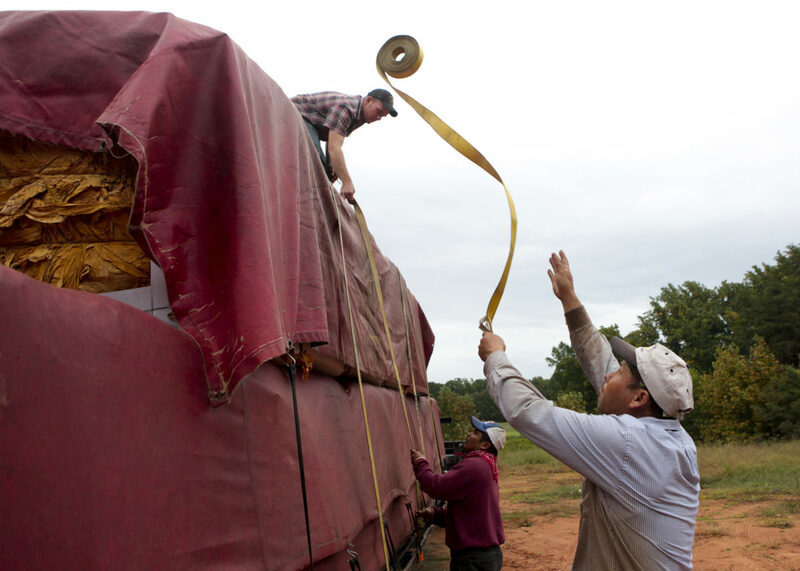 Taylor Ray Amos, 28, packs up bales of flue-cured tobacco with temporary workers Joaquin Perez Medina, right, and Jose Luis Galarza Zuniga, center, onto a trailer for delivery to Danville. Although conditions were advantageous in 2014, it is a risk to enter the tobacco growing world. The farmer considering the balancing act of producing the crop has to consider several factors, Stephen Barts, an agent with the Virginia Cooperative Extension said. On one side of the ledger is the laundry list of expensive pieces of equipment necessary to plant and harvest a crop. On the other side is the relatively stable and high prices that tobacco yields per acre, money that would take many more acres of grain to equal. Taylor Ray Amos never seriously considered making his living off of anything but tobacco. Growing up in the southeastern fields of Franklin County, Virginia, it was all around him, a craft and a lifestyle passed down through both sides of his family tree. But by the time he was in high school, his relatives were getting out of the business. It was 2001 when Amos’ great-grandfather died and his grandfather decided to quit. The government price support system, which had created relative stability since the 1930s, was being phased out. By 2004, the “quotas” that had governed how much tobacco each property owner or farmer could produce annually had been bought out, the industry returned to a free market system, even as payments resulting from the tectonic shift continued until 2014. Amos, 28, set out on his own in 2007, never personally experiencing the dynamics of the quota system. Instead, he has experimented and adjusted in hopes of creating the type of tobacco-growing operation that can succeed in the contemporary economy of the “Old Belt,” where fewer farmers are producing more tobacco, with an emphasis on quality. He has expanded his crop to 103 acres, aiming to place as much of it as possible into the top quality bracket of the cigarette companies’ rating system. And he’s not alone. Presented for portfolio purposes only. All rights are reserved by the copyright holder indicated above.